As we take our initial baby steps, our patriarchs guide and lead us in the right direction. When we stumble and fall, they assist us to rise and move on. In times of danger or any threat, they shield us from any harm. All of these, they do out of unconditional love. Their selflessness, though, has its own toll. Working tirelessly could lead to high levels of stress constantly and problems not only mentally, but physically, too. So better watch out for the signs. Has tatay been constantly complaining about losing strands and strands of his hair every day? Or maybe has he been searching for a way on how to get them to grow back? According to the hair loss statistics conducted by Statistic Brain in the year 2016, 40 percent of men experience noticeable mane vanishing as early as age 35. And as per the American Hair Loss Association, there are a couple of different factors that cause excessive hair fall, one being extreme degree of stress. Nutramedica Inc. introduced a revolutionary product that aims to address this problem: NOVUHAIR, nature’s answer to hair loss. Being the only topical scalp lotion in the country that is made from 19 natural herbs, essential oils and co-factor nutrients all working synergistically, it’s perfect for all the heads of the family out there, be they biological or not. NOVUHAIR is proven effective and safe to help prevent and stop the progression of hair loss and, at the same time, help promote locks’ growth. Simply spray a liberal amount of NOVUHAIR topical scalp lotion onto the scalp and massage for 5-10 minutes. Voila, it penetrates deeply into the roots, which helps rejuvenate, nourish and maintain the natural moisture of the hair. Still have no idea on what to give him on his big day? Well, NOVUHAIR might not be the most expensive gift to impress him, but the most valuable present he could ever have. This nature’s answer to hair loss provides him the chance to be ahead already in preventing his “crowning glory” from receding in the near future. So, head on to all leading stores nationwide and get a dose of this breakthrough product. NOVUHAIR is also available in shampoo and conditioner formats to further complement the benefits of NOVUHAIR topical scalp lotion. NOVUHAIR is available at Mercury Drug and other leading drugstores nationwide. You may also order NOVUHAIR online at www.lazada.com.ph. 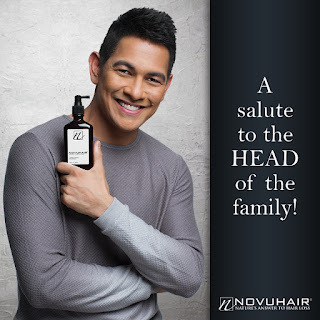 For inquiries, you may call 413-6570 or 0922-8830575, and visit www.novuhair.com.